Sometimes life’s most precious moments, the ones that make us come alive with a renewed sense of purpose, are the gentlest ones. They arrive unexpectedly and seep into our hearts silently, but change us forever. A year ago, I attended an Awakin Circle at Kinnari and Rahul’s home where I met Nipunbhai and that gathering shifted something inside me deeply - the seed that was planted there eventually cracked open and branched into a labour of love - heART circles – a joyous space where people discover the magic of paint, express their emotions freely and connect with their souls. But let me start at the beginning for it’s a slow story of many hearts beating as one. A year ago, I had a wonderful life – I loved everything I was doing and I enjoyed sharing time with family and friends, but I felt a yearning deep within to give more to and do more for the community around me. As this yearning grew, my life began feeling a bit empty, so I was compelled to address it. Eventually, I sat down to think about what I could offer, but nothing came to mind – after all, what did I have that was special? Since I couldn’t travel far from home (two young daughters), I looked up a few organizations in and around my neighbourhood, but nothing resonated with me deeply. I didn’t realize then that it was because I was working from the outside in, not from within. That was all about to change when I attended an Awakin circle that planted a seed of inner transformation. At the Awakin circle, the beauty, simplicity and compassion that I felt from every person moved me to tears. I knew that whatever I offered the community around me had to come from that space of deep love that washed over me that evening. I felt its transformative power and expansive energy that day. Kinnari and Rahul shared inspiring stories that ignited my own desire to radiate love and kindness. I sat with that familiar yearning again and this time, thought about what I loved deeply. Every member of my family, especially my daughters. Art. Painting. I love that sense of freedom I feel when I pick up a paint brush and bring to life the world around me; and, through my imagination, what I feel about or long to see in the world. In my life, through art, I create space, as Tolle puts it, “for transformation to happen, for grace and love to enter”. When I paint, I feel alive. As Picasso shared, “Art washes away from the soul the dust of everyday life” – could I facilitate a process that allowed others to access that sacred space? Although I knew that I wanted to, I was not sure how I could share this innate and intuitive (also deeply personal) gift with the community around me in a meaningful way. Nipunbhai arrived in Mumbai again. I heard him speak at Integral Space in Lower Parel. The yearning to give to and connect with a larger purpose returned, and this time, it refused to be shelved away, pushing me to connect more deeply with the internal transformation that was already underway. Later in the week, when I attended Awakin talks, the idea of doing small acts with great love stayed with me – all of the stories we heard had that beautiful thread running through them. My inner voice assured me, supportively and unwaveringly, “all you need is compassion to spread happiness”. That was it! I could start small. I could start with what I loved. I didn’t have any concrete ideas, but I had a burning desire to offer my whole heart through art in some way and I didn’t want to spend another year deliberating. I was ready to act and knew there was no turning back. After connecting with Rahul, Kinnari and Parag, who collectively offered their unconditional support and love that allowed me to believe even more deeply in myself, I decided to attend the Startup Service retreat, not knowing what would emerge, but with the faith that I would find my answers; I would find my path. I believed with my whole heart, and the universe answered. The magic of transformation was in the air from the moment I arrived in Sughad and it lasted far beyond the four days all of us spent at the retreat. I went in thinking about an art studio and emerged with the blueprint for heART circles. (List team members’ names if you wish) first listened to my highest intention (creating space for people to feel connected to their souls and express their emotions freely through the medium of art) and thoughts, then offered their ideas and asked me several helpful questions which gave me a stronger sense of direction. At the end of our initial brainstorming session, with the power and love of the collective - an invaluable, precious gift, for which I remain deeply grateful - I understood myself more deeply and connected strongly to a vision that was beginning to crystallize organically. The next day, with all of our hearts beating as one and this vision guiding us, we tapped into a greater intelligence through the power of the collective and the format fell into place beautifully (see below). 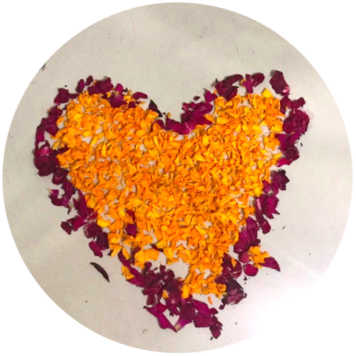 The distilled version of what was now OUR ultimate labour of love - heART circles - was born. The expansive energy that emerged through this process touched every member in the group – and I knew then that I would devote myself to heART circles for years to come. While I was deeply connected and committed to the idea that emerged, I was not confident about presenting; once again, the love and support of the group bolstered me and led me to confidently achieve what I would not have been able to do by myself. Radical inner transformation was a concomitant part of this process – (list team members’ names if you wish) lovingly saw the very best in me and elevated my dream by drawing out my highest potential gently and compassionately. Rahul and Parag, both of whom were volunteers at the Startup Retreat, also offered their unconditional love and support. My confidence soared as I surrendered to and trusted the process; I presented to an audience of that size and calibre for the very first time in my life. I can’t recall what I said as I stood up there, but I can tell you that I felt deeply connected to my heart, and to the hearts all around me. The joy of giving shape to the seeds of compassion sown in my heart moved me to tears and resulted in a standing ovation. With this overwhelming demonstration of love that I received with gratitude, I felt ready to share myself with the world. 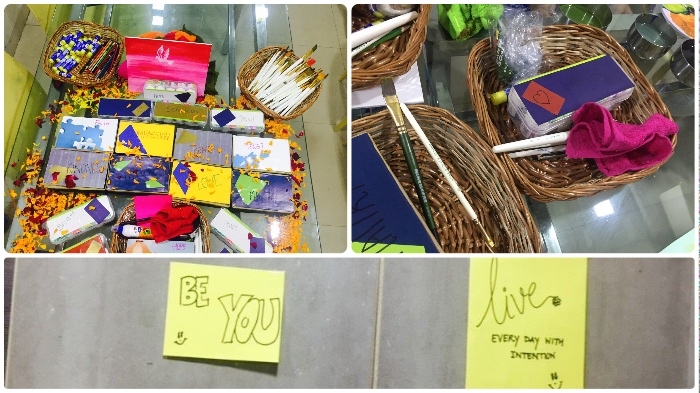 Beyond Art – Happiness is in giving. Giving can be anything – just a space in your heart is all you need. The room overflowed with the love and support of twenty people that day and the magic of the collective energy took over. We began as planned with thirty minutes of silence that would allow everyone present to connect with themselves deeply after which they painted in silence. Everyone was encouraged to harness their inner creative resources (versus painting from memory or models) following one simple guiding principle: When you change within, the world changes, or in the words of J Krishnamurti, “If you begin to understand what you are without trying to change it, then what you are undergoes a transformation”. Indescribable joy and peace flooded over me as I watched colors flying and brush strokes moving in every direction, silently guided by inner sparks that emerged in what began to feel like sacred space. I learned one of the most significant lessons of my life that day – all we need to give one another is space in our hearts. 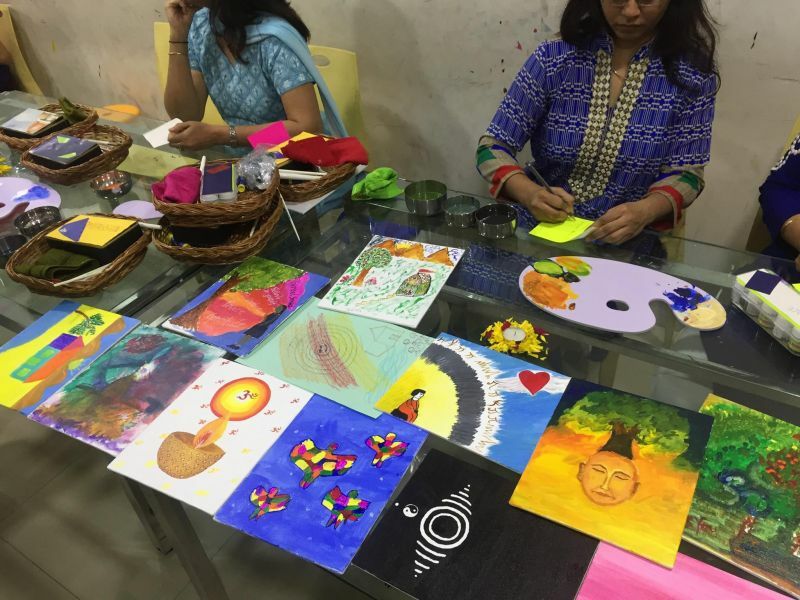 During the sharing and reflecting round, many of the participants expressed their joy and love through tears as they shared the stories and concepts that guided the colours and strokes. One girl described the joy she felt as she connected with art after years. Many shared that they had no idea how what emerged on the canvas did and spoke about how they were guided by faith and love. One woman shared that she saw the divine in each person present that day and that God was present amongst them, holding the space with infinite love, kindness and compassion. She expressed her love for everyone through a drawing inspired by Mother Nature. Everyone connected seamlessly and deeply as they shared. A spirit of oneness was palpable and I realized in that moment that this feeling of shared humanity – the emerging stories – those are the true artistic treasures. And it was then that I felt the magic of true joy. 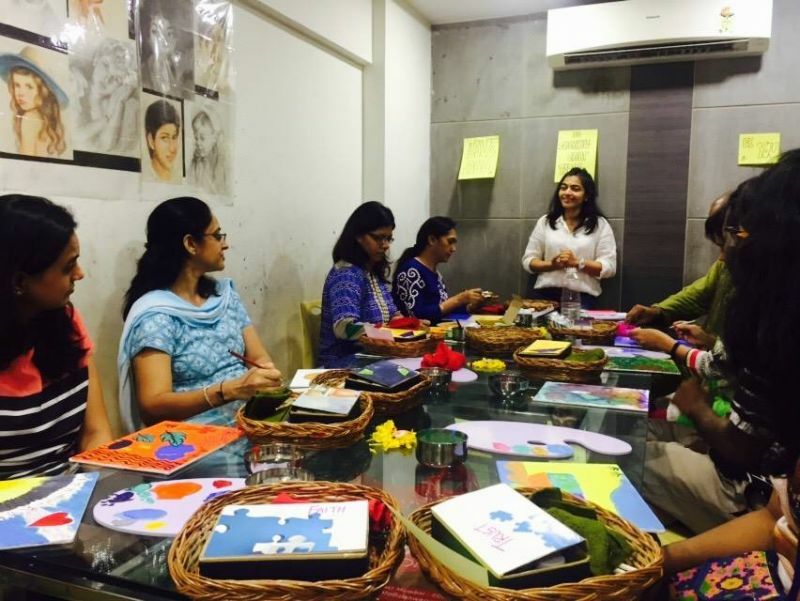 Art circles are held in Ghatkopar East on Thursdays from 3.30pm to 5pm; all are invited to attend. It is true that one person came into your life and change your life totally. That one person gives you lots of memories and lovely moments.